Dr. Michael Jay Strongin has been a practicing Obstetrician and Gynecologist on the Upper East Side of Manhattan since 1977. Trained at Cornell and New York Hospital, he was Assistant Clinical Professor of obstetrics and gynecology until June 2007. In 2008 he became the Director of Gynecology at Lenox Hill Hospital, and Associate Chairman of the OB-GYN department at Lenox Hill Hospital. He is actively involved in resident training and teaching. His past honors include listing in Best Doctors in America since 2001 and being named Best Doctors in New York in New York Magazine multiple times. He has been past president of the New York Gynecologic Society and has been a consultant to the office of Professional Medical Conduct for the state of New York. Dr. Strongin’s gynecological expertise includes treatment of fibroids, ovarian cysts, abnormal bleeding, pap-smear problems, and post-menopausal issues. He is skilled in surgical management of ovarian cysts, fibroids, and performs advanced laparoscopic procedures as well as traditional abdominal and vaginal operations. General obstetrical care remains a passion of his. 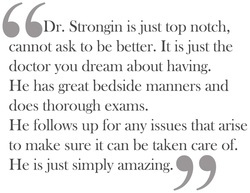 Dr. Strongin has wonderful partners, and as a group their goal is to maintain the highest level of care rendered in a personalized and professional manner.